When will these jerks learn? 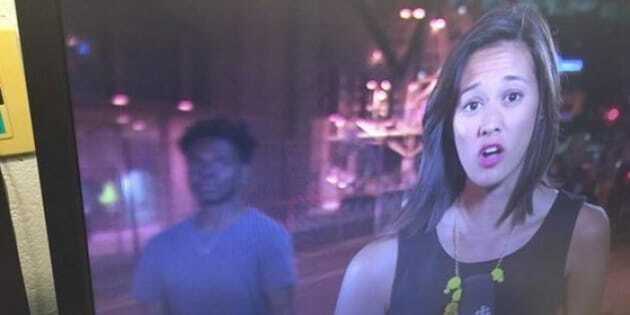 During the final night of the Pan Am Games in Toronto, yet another female reporter was verbally assaulted on camera. CBC reporter Charlsie Agro was praising the strong female athletes at this year's games when a man in a blue shirt shouted the offensive "FHRITP" phrase during the live broadcast. Following CityNews reporter Shauna Hunt's take down of a group of men who hurled the saying at her during the TFC season opener in May of this year, female sportscasters have begun confronting abusers on camera. But while audiences cheer on these women for standing up for themselves, the CBC has asked them to stand down, reports VICE. According to CBC internal documents obtained by VICE, the broadcaster has requested reporters do not engage with abusers to avoid escalating the situation. While the document states the precaution is to ensure physical safety, the company also advises against using social media to shame the abusers online saying that it "comes with its own perils and is highly contentious." But Agro, who already dealt with the phrase earlier this month, isn't following her employer's request. Had an unfortunate #FHRITP incident today while interviewing a @TO2015 coach. Come on #yyz, let's set a better example than that. Following the broadcast, Agro announced via Twitter that she was working with the Toronto Police to file an incident report. Within the hour, the police were tracking down evidence and reviewing the footage to help identify the abuser. Thanks to all who have sent support. I am with @TorontoPolice right now filing report on #FHRITP incident. While the man has yet to be identified, the police are looking for tips from the public.